^ Gans, Andrew (21 September 2017). "Which MSNBC Host Directed Lin-Manuel Miranda in His First Musical?". playbill.com. Retrieved 16 November 2018. ^ Hayes, Christopher. "Articles for Chicago Reader". Retrieved 15 January 2017. ^ Hayes, Christopher. "Articles for In These Times". Retrieved 15 January 2017. ^ a b c "Chris Hayes". Retrieved 15 January 2017. ^ Kaufmann, Greg (2010-02-25). "CPR for the Public Option". The Nation. Retrieved 2016-09-20. 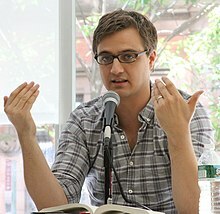 ^ "'All In with Chris Hayes' wins Emmy® award". MSNBC. Retrieved 10 October 2018. ^ Staff, Variety (2 October 2018). "PBS, CBS, HBO, CNN Garner Big Wins in 39th News and Documentary Emmy Awards". Variety. Retrieved 10 October 2018. ^ Morales, Chloe (16 June 2017). "Brooklyn Book Festival's Author Lineup Revealed". Brooklyn Patch. Retrieved 19 June 2017. ^ Kellogg, Carolyn (16 March 2017). "The L.A. Times book festival schedule, tickets, and Innovator's Award winner announced". Los Angeles Times. Retrieved 19 June 2017. 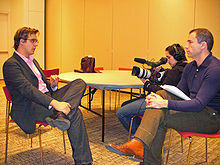 ^ Chris Hayes [@chrislhayes] (29 November 2011). "I'm a daddy! Our daughter Ryan Elizabeth Shaw-Hayes was born yesterday at 8lbs 3oz. She's perfect! Mom & daughter are both doing great" (Tweet) – via Twitter. ^ Chris Hayes [@chrislhayes] (27 March 2014). "Introducing...David Emanuel Shaw-Hayes. 8lbs of pure sweetness, born to the best mom on the planet & an awestruck dad" (Tweet) – via Twitter. ^ Chris Hayes [@chrislhayes] (3 January 2018). "Anya is here! Her amazing superhero momma basically bent iron with her sheer will to get her out. We're so in love with her" (Tweet) – via Twitter. This page is based on the Wikipedia article Chris Hayes; it is used under the Creative Commons Attribution-ShareAlike 3.0 Unported License (CC-BY-SA). You may redistribute it, verbatim or modified, providing that you comply with the terms of the CC-BY-SA.